I'm continuing my countdown to Halloween covering scary, creepy and Halloween-appropriate Christmas entertainments. Who doesn't love a witch at Halloween? This Halloween, I'm reminded of the 2010 holiday TV movie The Good Witch's Gift an original production from The Hallmark Channel. This Christmas TV movie is the third in a sequence of The Hallmark Channel's highest-rated movie series of all time. The series is based on the characters from the first movie The Good Witch in 2008. Actress Catherine Bell plays Cassandra Nightingale, or more simply Cassie, a mysterious woman who seems to be at the center of magical occurrences in her small town. Bell became a household face after starring on the long-running, military/law drama JAG. Fans of this show already know that JAG produced seven Christmas episodes during its run from 1995-2005. More recently, Bell has starred in the Lifetime original series Army Wives. The Hallmark Channel original Christmas movie The Good Witch's Gift sees Cassie and Jake (played by actor Chris Potter) finally setting a date for their wedding: Christmas Eve. There are several hurdles to overcome before the wedding: young Lori loses Cassie’s wedding ring, there was a mix up with the marriage license, the bride and groom have no minister for the wedding, and they are without a wedding cake. Will Cassie use her magic to make her wedding day a perfect one? Attention Degrassi fans: Jodi Deeks, a character in a side story, is played by actress Jordan Todosey. You may recognize her as the ground-breaking f-to-m transgendered teen, Adam, in the current episodes of the Canadian teen drama. Full Disclosure: I'm addicted to Degrassi. The fourth movie in The Good Witch film series recently aired on the Hallmark Channel entitled The Good Witch's Family. And, the announcement has recently been made that a fifth movie is to be created. 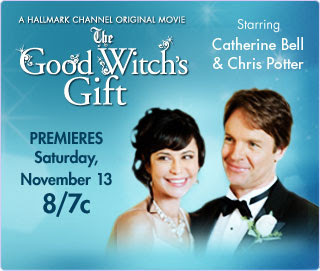 I'm sure this Novemeber and December, The Good Witch's Gift will return to the Hallmark Channel holiday film schedule. Did you see it last year? Do you like watching Hallmark Channel movies at Christmas time?